At Surfs up, dude! You won’t find an online slot cooler than Wipeout. This online slot really gives you that great summer feeling as you catch the waves and hopefully a handful of cash as well! 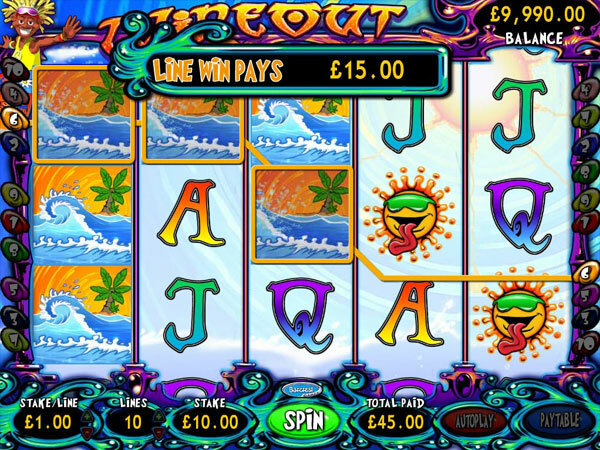 The wipeout slot is the latest release from popular fruit machine manufactuer Barcrest, who are famous for making some of the best online fruit machines including Rainbow Riches, Captain Jackpots and Cashino. Whether Wipeout is actually a fruit machine or slot is up for debate, but it’s definitely a great game. This 5-reel, 10-payline is bright and colourful and is packed with great features to keep you entertained. Some of the symbols featured in the game include a smiling shades-wearing sun, a hippie-style Volkswagen camper van, and crashing waves. In fact the Crashing Wave symbol acts as wild symbol to substitute for other symbols required to make a winning combination. Click here to get £10 free from Sky Vegas to play Wipeout. Wipeout has one of the most unique ways of earning free spins and is really an exciting feature of Wipeout. If you hit three, four or five of the Surfer Dude Free Spin symbols you will unlock the brilliant Free Spins bonus feature and receive 5, 25 or 250 free spins respectively. Further to this, you will receive three ‘lives’ represented by the Surfer. You will get an extra life if the Surfer appears on reel five and lose a life if the Wipeout symbol appears on reel five. You can use up your free spins until all lives have been lost. As if that wasn’t enough, if you manage to get to 20 free spins you’ll win a multiplier bonus of 20x your triggering bet amount, and 200x if you survive to 50 free spins! Wipeout is a fantastic, surfing themed slot game that is bound to provide you with endless entertainment as you dream of winning enough cash to whisk yourself off to a far off tropical island to catch some sun, sea and surf! When it comes to playing Wipeout slot online, you can do so at Sky Vegas, where you can also enjoy many other Barcrest fruit machines. New customers only. 18+ T&C's applyNew Customers Only, Play on Premier Collection slots to qualify. Bonus is subject to 10x wagering requirements and will be credited upon completing the qualifying amount. Free spins are subject to 1x wagering. Full T&C’s apply.